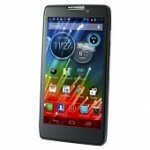 The RAZR HD is a powerful and good looking Android phone with a huge battery, and it’s also good value on contract. Splashproof coating and scratch-resistant Gorilla Glass screen, and the large 2,530mAh battery meant the phone managed a huge 14 hours in our video playback test. The phone’s 4.7in screen is an AMOLED model with a 1,280×720-pixel resolution, and is just as impressive as that of the Samsung Galaxy S3.